Rinse grapes and pat to dry. In a large bowl, mix softened cream cheese, sour cream, white sugar, and vanilla. Add grapes to the cream cheese mixture and stir thoroughly to coat. Transfer to serving bowl. Sprinkle brown sugar over grape mixture. Cover and refrigerate until ready to serve. Right before serving sprinkle nuts on top. *The longer you chill the more the flavors will meld and the brown sugar will dissolve into the sauce. You can chill it up to 24 hours. I haven’t always been a fruit lover. In a house with ten kids it seemed like there was always some kind of fruit spilled and then smashed on the kitchen floor. I can remember several times being the lucky one to actually step on the smashed grape. Probably until after I got married, fruit and I were still not friends. But a couple of years ago I found a whole new love for it. Now my family and I eat tons of fruit and literally go through pounds of grapes a week. 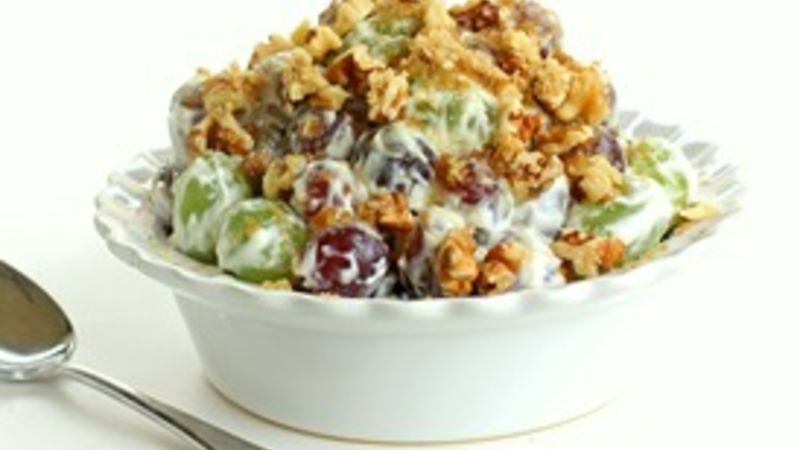 This Grape Walnut Salad dresses up regular old grapes and turns them into fabulous dessert salad. It’s creamy and decadent … yet refreshing and light at the same time! It’s that time of year when dessert salads are the fresh ending that we want to a meal. This grape salad has beautiful colors with the bright green and red grapes. It’s covered in a cream cheese and sour cream dressing then topped with a little brown sugar and chopped walnuts. The textures and flavors are such a perfect combination. Lighten it up: There are many ways to lighten up this grape walnut salad. Try using low fat cream cheese or light sour cream in the dressing for a healthier version of this dessert. I promise you that you will not be able to even tell the difference.